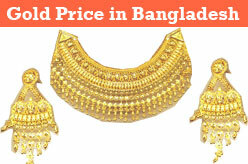 Find Gold and silver rate today in Bangladesh. Top quality Gold price per Bhori 50,155 BDT from Today in Bangladesh. 1,772 Taka increased from previous (48,989) gold price. But traditional gold price remains unchanged. Price List for local market from : 29th January, 2019. Page Updated : 6th January, 2019. Source : Daily National Newspapers / Bangladesh Jewelers Samity (BJS). Please visit us for our next update. 22 Karat/vori 91.06% pure gold. 21 Karat/vori 87.05% pure gold. 18 Karat/vori 75.00% pure gold. No specific standard for Shonaton (Traditional Bengali Gold). Disclaimer : While every effort is made to verify the information published on this site, no responsibility or liability is accepted for any errors, omissions, or changes. Always check with the relevant vendor, company or organization for details of their service, prices & availability. Date : 2nd January 2019 to 28th January 2019. Date : 5th August 2018 to 1st January 2019. Date : 20th July 2018 to 5th August 2018. Date : 21st June, 2018 to 19 July 2018. Date : 19th March, 2018 to 20 June 2018. Date : 26 January 2018 to 18 March 2018. Date : 10 January 2018 to 25 January 2018. Date : 25th December, 2017 to 9th January, 2018. Date : 26th September, 2017. Date : 20th September, 2017. Date : 11th September, 2017. Date : 13th August, 2017. Date : 28th July, 2017. Date : 8th May, 2017. Date : 9th February, 2017. Date : 14th January, 2017. Date : 07th December, 2016. More Previous Price List of Gold in Bangladesh.